Colour: smooth white liner and green cover with a violet longitudinal identification stripe. 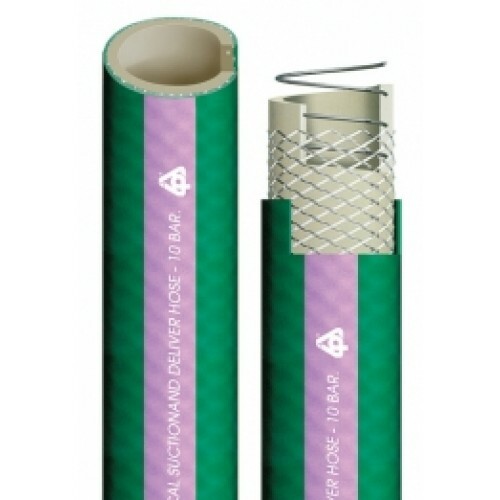 Technical Features: white/beige TPV inline, reinforced with steel spiral and polyester yarn. The product is smooth inside and outside to reduce friction. Properties: it keeps a good flexibility in spite of the thickness. Robust hose dedicated to the chemical industry, suitable for suction and delivery. Really good resistance to most chemical substances, ageing, weather conditions and ozone. Halogens free and conform to RoHS.